I bought this Speed Graphic as a source of parts as it was cheaper to buy the whole camera than buy the two parts I wanted individually. When it arrived I realised that although the graflok back was missing and the shutter was broken what was left was still a viable camera. I use my other Speed Graphic for portraits, hand-held and usually with bulb flash. 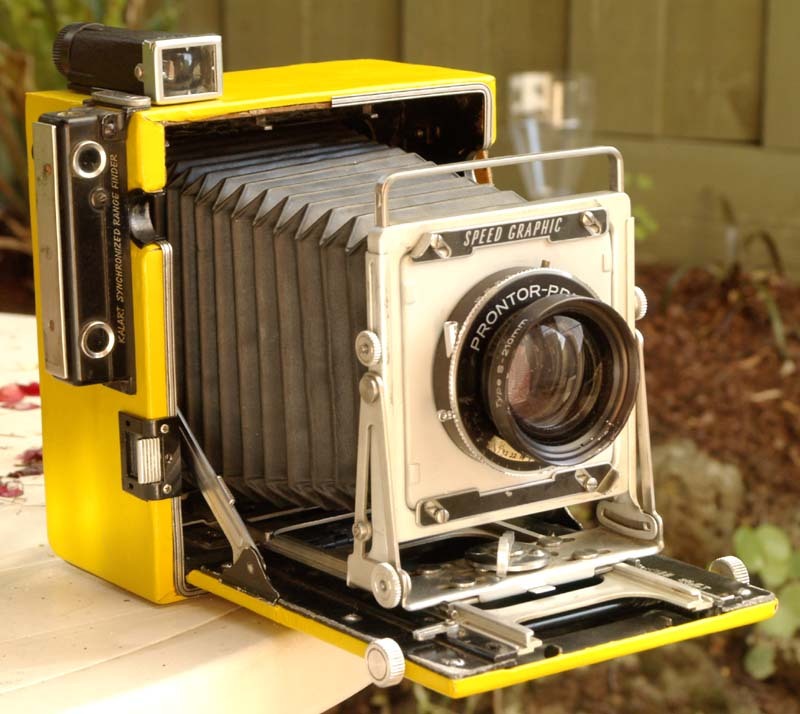 I find the camera unwieldy to use when tipped over onto it’s side to get a portrait format. Why not turn the bellows 90 degrees so that it was in the correct orientation for portraits? With the shutter already broken and the graflok back gone there wasn’t much to lose so I made a start. The leather was tatty and torn so I decided to replace it. I found a local leather supplier that had hides that were suitably thin and flexible but unfortunately the only colours they had were a medium green and a mustard yellow. As I was walking out I saw a piece of acid yellow leather in their offcuts bin that was badly creased. That cost me a whole dollar while the other pieces were $10 each. Reskinning was fairly straight forward. First the broken shutter was removed and the holes filled up with MDF plugs and plastic filler. I used the old leather as a pattern and cut the leather with ordinary scissors. It was stuck on with rubber contact cement which requires precision but isn’t too bad with a little practice. The most difficult bit was the front of the focussing bed which has a large bulge. I made a frame to go around the edges of the bulge and clamped it in place. This stretched the leather enough that there weren’t any wrinkles. Unfortunately the frame was clamped a little too tightly and left a visible mark, but it isn’t all that bad. The only other complaint is that perhaps the leather was a little too thin. The hex nuts that hold the focussing rack in place are clearly visible under the leather on the right hand side, so I’ve got "Zeiss bumps" from day one. I’ve also repainted some of the chromed bits gloss black to contrast with the yellow and that part went well. Well, that is all the cosmetic stuff. The real changes are visible from the rear. The bellows was disconnected from the front standard easily enough but at the rear it is bolted to a thin metal plate that is integral to the camera. I ended up cutting around the edges of the plate and then turning it 90 degrees and glueing it back in place. It wasn’t very elegant but it worked. Having done that the bellows were then reinstalled relatively easily. The next step, as yet unfinished, is building the new back. I use grafmatic backs almost exclusively because I find them easier to load and much more convenient than conventional double dark slides. I decided to build a spring back that would hold a grafmatic which would slot in from below. I started by cutting a piece of 1 mm aluminium plate to fit inside the rear of the camera and then cut a 100 x 120mm hole in that. I also had to remove some wood from the base of the camera. I have made a couple of wooden rails to position the grafmatic horizontally and there is a piece of square brass tube at the top to position it vertically. The grafmatic has a ridge across one end to hold it in place, so the corresponding slot was formed with strips of 0.5mm aluminium glued to the 1mm plate. Above that you can vaguely see the wide slot cut in the bottom of the camera for the grafmatic. This is my first attempt, using four mousetraps. I’ve narrowed them a little and bent them to follow the contours of the grafmatic but that is about it. The trap uses a type of staple to connect the wire bits to the wooden base. I’ve opted for screw in eyelets that came with a picture hanging kit. I’ll paint the woodwork with some black enamel when I get a chance. You can see here how the grafmatic sits out of the bottom of the camera. The next task is to make a slip in focussing screen. 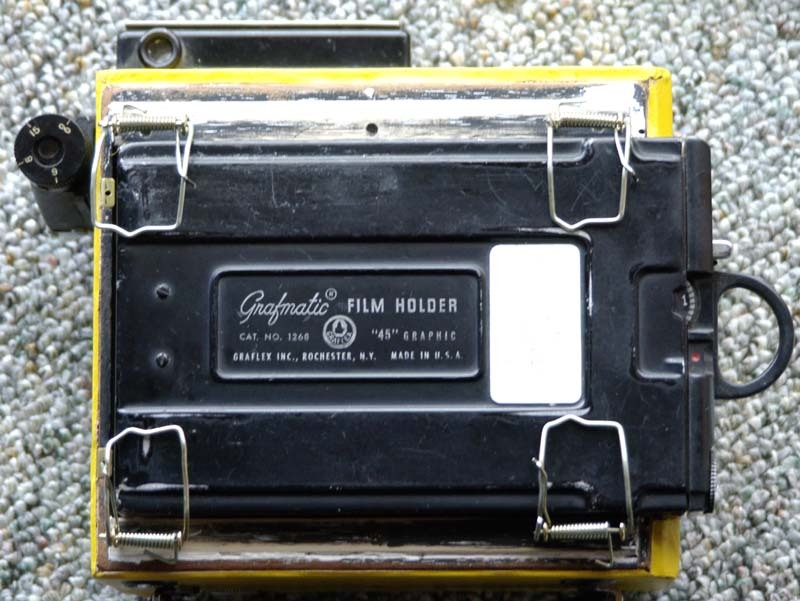 I’ve got a couple of old film pack holders making their way over from the US and I’ll cut a hole in the back of those and rig up some sort of folding screen to keep the light off. Once that is done I can get a new mirror for the rangefinder and get that working and it will be all done bar some missing trim. 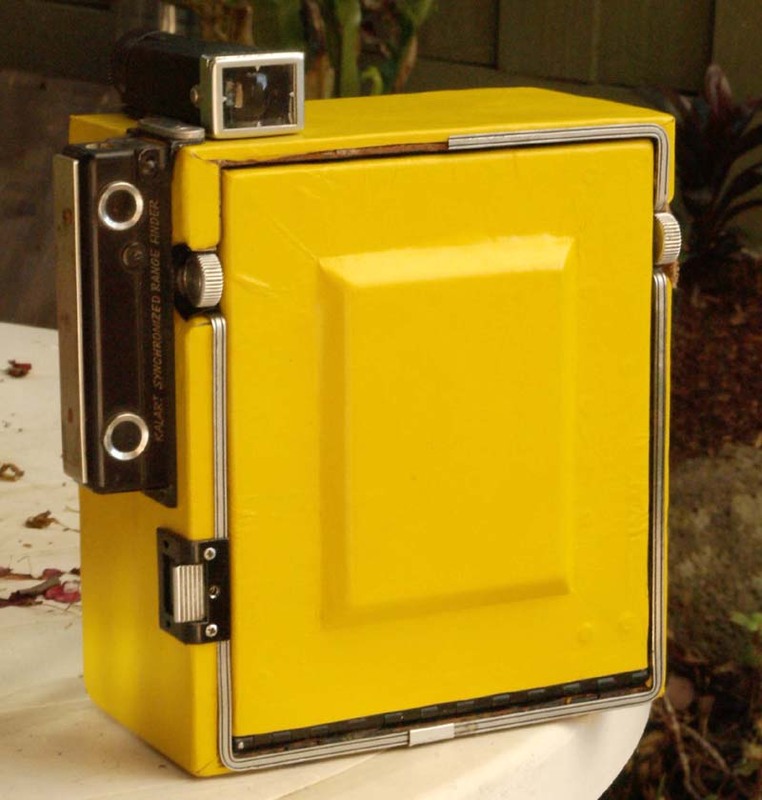 Here is the starting point for my focussing panel project: a Graflex 4×5 Film Pack adapter. 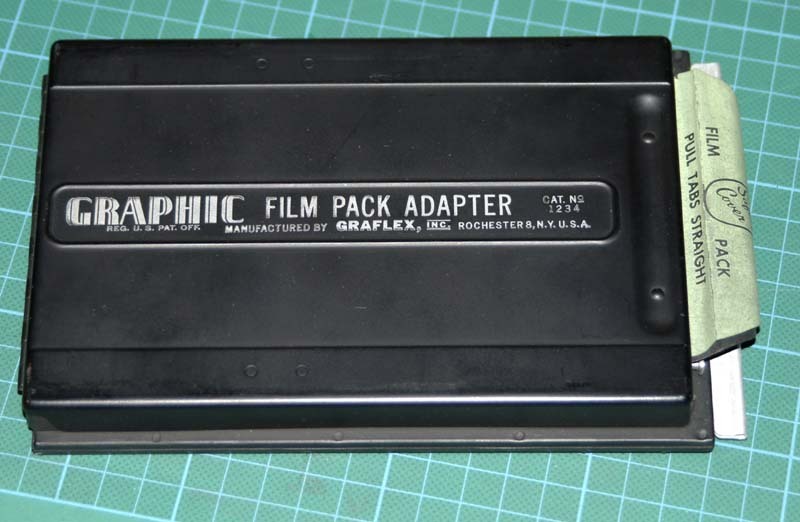 Film packs were last manufactured in the early 1990s, and the adapters used to hold them are now bascially worthless. 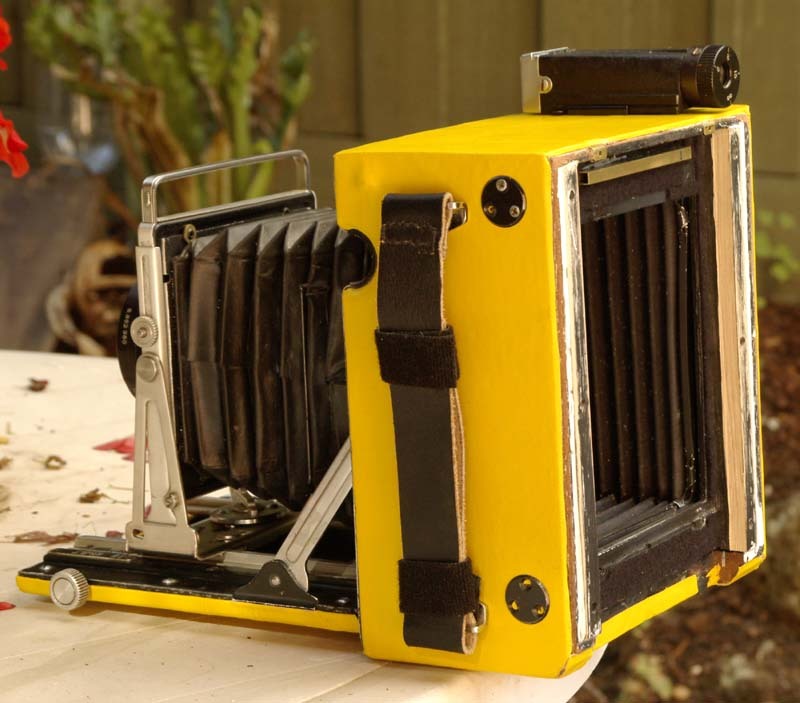 They are a common sight on eBay and many, like the one pictured here, still have some badly fogged film in them. I actually shot the rest of the film and developed it just to see what I would get but it proved to be a pointless exercise. The idea is fairly simple. 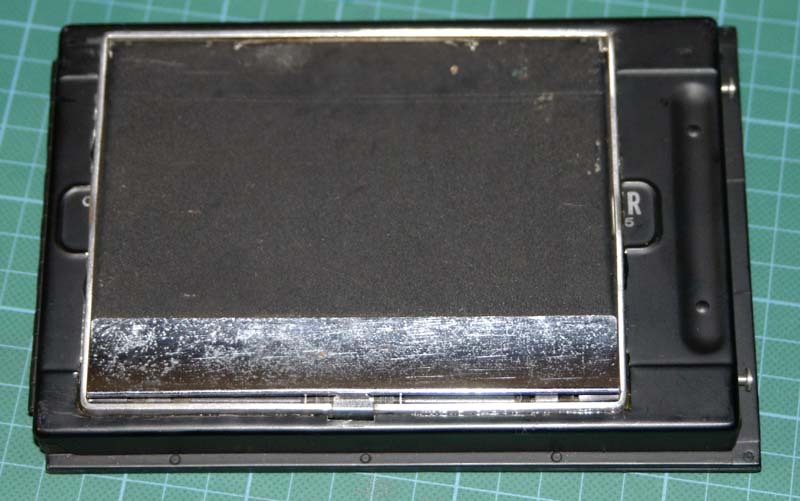 First, attach a ground glass screen inside the film pack at the correct registration distance. Next, cut a hole in the back of the film pack so that you can see the screen. Last, rig up some sort of hood to keep the light off the screen. So here we are. 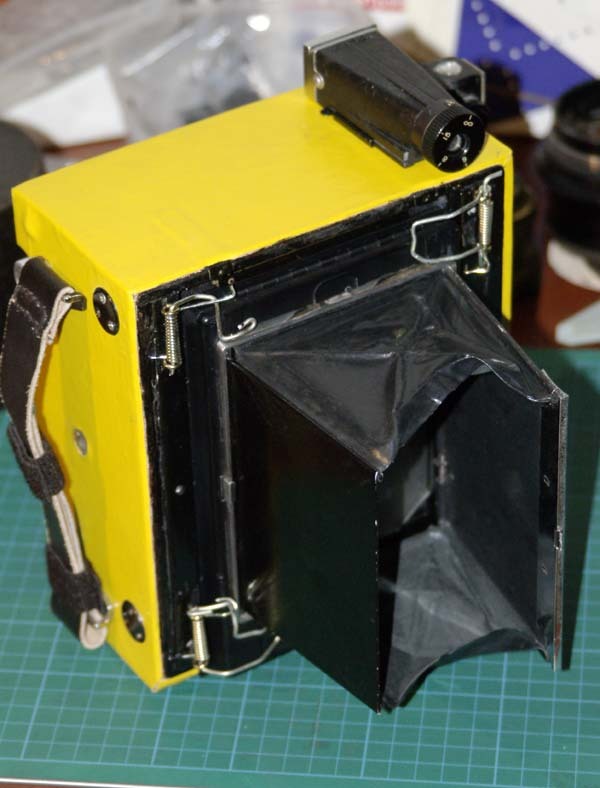 On the left side is the inside of the rear of the film pack with the hole cut out and a folding hood glued in place. The hood was a spare from a Super Graphic. First step was to trace the size of the opening on to the inside of the back of the adapter. By which I mean that I took out the darkslide and ran a pencil around the inside. This made sure that the hole I was going to cut was in the right place. I then measured up the hood and cut a matching hole. The hood was then glued in place (using “weldbond”). 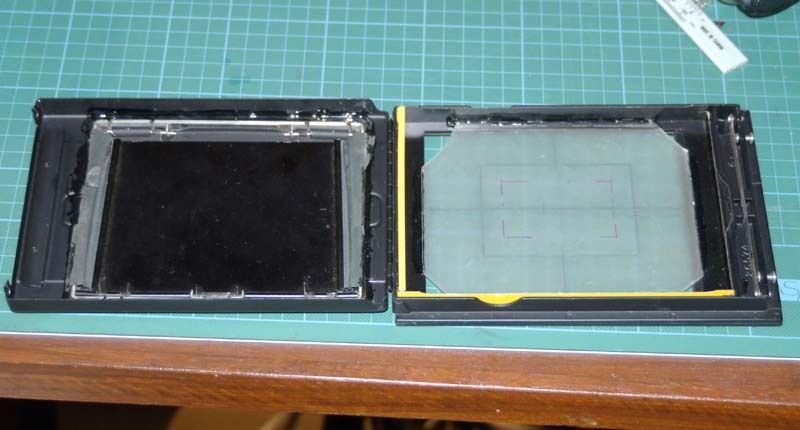 On the right side is the inside of the front of the pack with the ground glass glued in place. 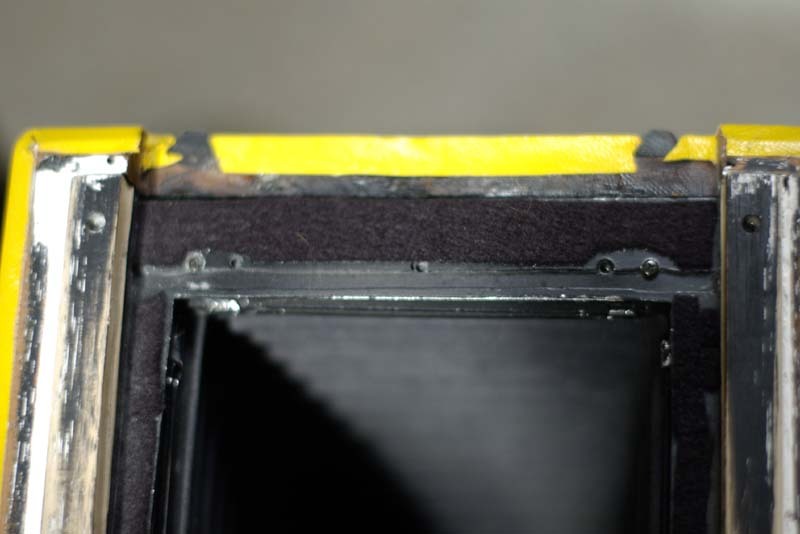 To get the correct registration distance I have actually glued the screen to part of the original film pack (it is the yellow painted metal). 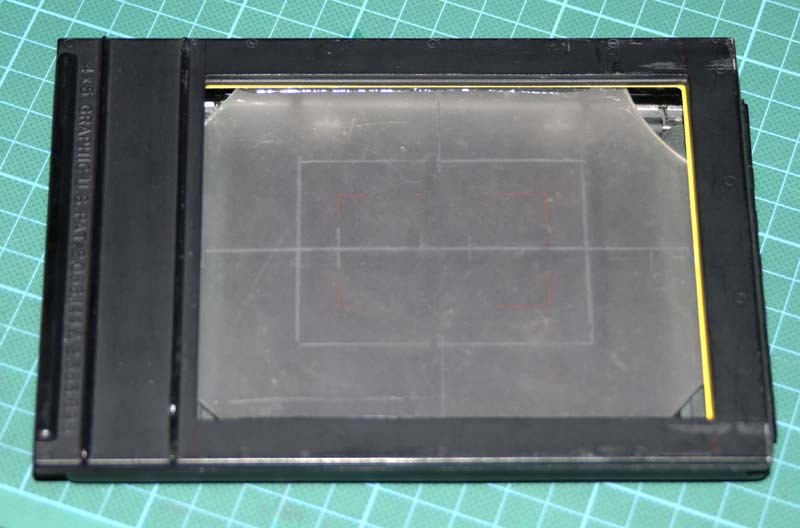 The film would have sat hard up against this part of the pack, so this should be the correct place for the ground glass. Here is the back of the focussing panel with the folding hood glued in place. It still needs to be painted and maybe have some matching leather trim applied. And here is the front of the focussing panel showing the ground glass. The completed panel in the spring back. I had to modify the spring back slightly so that the hood could open up. Having done that, I think the next step will be to replace the bent wire arms with pieces of aluminium. They will probably end up being L-shaped, a bit like the bent wire version at bottom left.